The Gambatte Dojo at Aikido of Nebraska has been going through many changes over the last few months. The student population is continuing to grow both in numbers, and in their on-going self-development. Many new students have passed their preliminary tests and are progressing through the ranks. Aikido of Nebraska recently had an Open-House, and had 41 participants over the 2-day event. Several of these participants went on to become students, but all enjoyed good sushi, good training, and an eventful afternoon. We invite all those interested to partake of our next Open-House in the Fall of 2010. Can’t wait that long? OK then , please come into Aikido of Nebraska at your earliest convenience, and see what it is all about. Aikido of Nebraska will be hosting an Open House on Mar 20-21st, Sat-Sun afternoon. The Open House will go from 12:00pm-3:00pm each day, and is open to all the public. Attendees will be able to see a traditional Martial Arts Dojo, and view the students in regular practice. Refreshments will be provided. Many people are intimidated by the thought of participating in a Martial Arts class. The Open House is designed to help those people see that training in the Martial Arts is an enjoyable and beneficial endeavor. The student at Aikido of Nebraska is allowed to progress at their own pace and safety is at the forefront. The Open House also allows people to see the rich culture of the Martial arts in an educational venue. Attendees are encouraged to ask questions and find out everything they always wanted to know about the Martial Arts, and Aikido. When I was watching the Superbowl last week, the announcer interviewed the head coach of one of the NFL teams on how, and why, he was so calm. He said “No matter how calm I look on the outside, I am calmer on the inside. When you are prepared, there is nothing to get riled up about . . .”. At Aikido of Nebraska, this is what we strive for; Preparedness. Preparedness not only in self-defense situations, but preparedness for all of life’s challenges. In order to be prepared, you must be willing to educate yourself on a variety of subjects, even if they do not apply to your current situation in life. Second, you must develop the attribute of Adaptability; the ability to change quickly to changes in your environment. In Aikido, one does not always know the way the attacker will attack; he/she must adapt and change on a dime, and must be prepared for several contingencies, regardless of which one is presented. At Aikido of Nebraska, ongoing education and adaptability are life-skills which are learned through the practice of self-defense. There is no Luck, only Preparedness. I recently attended an Aikido seminar, where the Shihan (Master Instructor) who was teaching relayed a maxim that he was taught, which goes “Cry in the Dojo, Laugh in the Real World”. That statement struck me as it applies to Martial Arts training. I often tell the students at Aikido of Nebraska that if they really care about their training partner, they must try to “kill” them. Really. No Aikido student wants to train only to find out that his/her techniques don’t really work because they never got real attacks when they were in the dojo. Thus, in the dojo, the student must focus on delivering accurate and true attacks to his/her partner, so that they may respond appropriately. The student is not truly doing technique if they never got attacked “for real”. In the modern world, with ever-increasing demands placed on us from work, kids, commuting, spouse, etc. it is a true gift to come into the dojo and do nothing but work on yourself. It is a true maxim that what you put into your training is what you will get out. The real trick is to make training more and more difficult for yourself. You need to get more precise with your footwork, connect better with your partner, shift your balance more precisely, control your emotions better, and have your partner deliver increasingly difficult attacks. In this fashion, as you are able to handle the increasingly difficult training, an attack on the street will seem easy by comparison. And guess what? Your real-life stresses will seem easy by comparison as well. Now, this strategy requires some common-sense as well. You need to increase your difficulty along with your ability to do the technique. A beginning student cannot expect to take a real attack from day-one, and expecting too much of your performance will only get you frazzled and burned-out. However, over time, “Cry in the Dojo, Laugh in the Real World” is an excellent strategy to become more successful in and outside of the dojo. 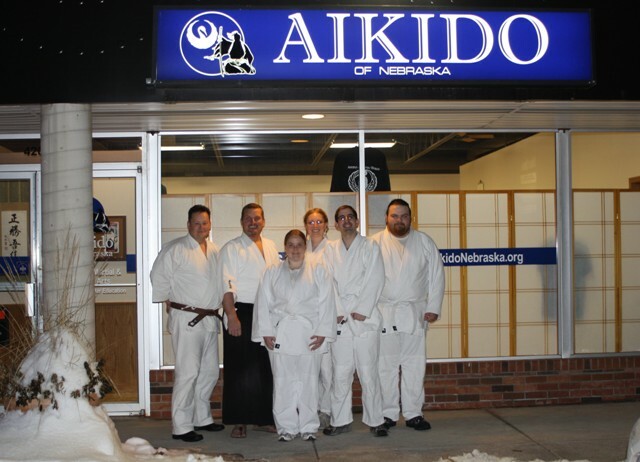 The students at Aikido of Nebraska celebrated New Years Eve with excellent training sessions in the Martial Arts. What better way to start the New Year? The dojo is now 4 months old and doing very well. Membership is continuing to increase, and students (and Instructor) look forward to the simple daily act of training. Its New Years Resolution-time! C’mon, You have been thinking about finding some stress relief, getting in better shape, and starting something thast could change you life. So, if you have been on the fence about training at Aikido of Nebraska, but haven’t done it yet, do so now. There are no high-pressure tactics; we want happy students. Come down and see a class, and talk with the other students to see what the “buzz” is about. When people see the benefits firsthand, they don’t have to be “sold”, they join. In the quest to better ourselves, Aikido students at Aikido of Nebraska work diligently on the concept of control. The student very quickly realizes that the more they can control their own actions, footwork, balance, and responses, the better they will be able to control others (i.e. the attacker). Learning this aspect of precise control is quite difficult, and require years of training to achieve. The student comes to learn that, if the technique doesn’t work, it is because he/she failed the technique, not the other way around. In this regard, the student takes responsibility for themselves, and recognizes they must acquire new levels of control in order to perform the technique correctly. Like most of the lessons in the Martial Arts, this lesson applies to life as well as training. In our current society, we often get caught up in trying to get out of taking responsibility. Oddly enough, it is this failure to take responsibility that leaves many of us feeling depressed and out of control. The more we avoid responsibility, the more we feel like “life is out to get us”, or “I can’t ever seem to catch a break”. Taking on that responsibility allows us to remain in control, because it now becomes our choice. Yes, more responsibility involves more work, but doesn’t feel better when you beat yourself up instead of letting someone else do it? Either way you will get beaten up, but at least one is your choice, and therefore under a certain amount of your control. Therefore, make a goal of taking responsibility for every aspect of your personal life. Therefore, when something goes wrong, it is not the fault of your accountant, financial advisor, doctor, or mother, it is yours, because you are the final authority over your own life. But you know what? Ultimately, it feels better to take back that control. And, like training, the better you can control those aspects of your own life, you will find that life seems to be more fair, and you will have more influence (and control) on the world around you. When a Japanese sword begins its journey to becoming a sword, it starts out as a lump of steel. The steel is hammered out flat, folded and hammered out again countless times. The steel is then hammered out, flattened, and cut into the basic shape, and clay is added to all but the edge of the steel. The sword is fired again to temper the steel, giving the sword its’ legendary cutting edge. The sword is then polished with stone to give it its brilliance. As you cam imagine, this process takes a long time, and is performed by experts. When the sword is finished, it is transformed into an instrument that is simultaneously a deadly weapon and a work of art. There are no short-cuts to this process; if one step comes out badly, the sword is scrapped, and the process starts over again. It is possible to obtain imitations, and they may be deadly, or they may be beautiful, but they are rarely if ever both. To most people, there is no substitute for the real thing. At Aikido of Nebraska, when I ask the students why we do Aikido, the running answer is “to polish the sword”. I believe most students would agree that self-defense is not the primary benefit when learning a Budo (Martial Way) such as Aikido. Learning self-defense techniques against real attacks must remain a priority when training, or else there is a risk of the art becoming “fake” or just a complicated and ugly dance. But the real benefit is that training allows us to forge ourselves, face and push through our physical and mental limitations, become more aware of who we truly are, and reinforce the good habits and courtesy amongst our fellow man. Make no mistake; there are days when your training becomes very frustrating. Hitting up against your personal limitations is a sobering experience, and no one like to be reminded of what they “can’t do”. However, with the right school and the right instructor, training is fun, and when something is fun, you don’t realize how much work you are putting in it. Also, one learns to not take themselves so seriously, and so learns to deal with training, and life, better. Are you taking time out of your day to “Polish the Sword”? If not, come see us at Aikido of Nebraska, we’ll make sure that you are having so much fun during your training, that you don’t even realize that you are becoming a better person. 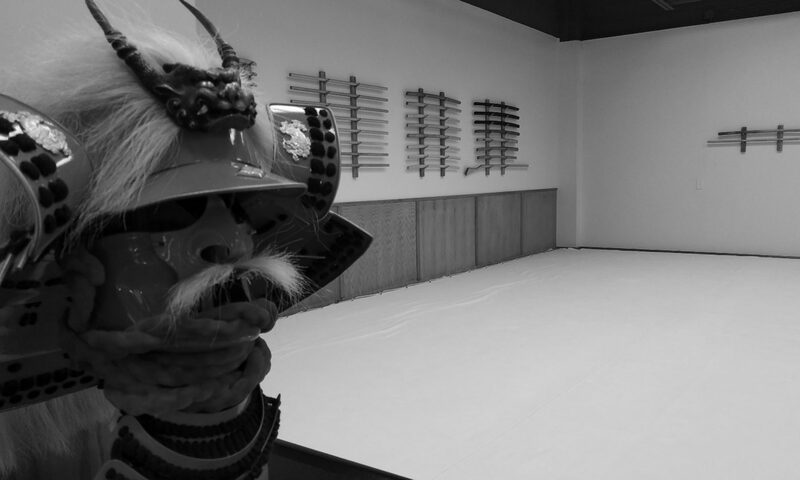 In the Martial Arts Training Hall, there is often a period of silence before starting class. If there isn’t, and the students are still talking, the instructor may say “Mokuso!” which in Japanese means “To Silence”, or “Contemplate!” However, a better way to think of this, as in Dave Lowrey’s book In the Dojo, where he defines “Mokuso” as a transitional period. Many think of the Dojo (training hall) as a place of refuge from the stresses of the modern world. In reality, the Dojo is a place where one learns to better confront and deal with the stresses of the modern world. In the dojo, the student learns more about the world by learning more about his/her self, and so, the Dojo becomes a world-in-miniature, to the world outside. Mokuso allows the student to put the cares, stresses, aggravations of the outside world aside for a moment, in order to prepare himself to train. When his training is finished for the evening, he or she again returns to Mokuso so that he/she can transition back to life outside the dojo. So what is the trick to “Mokuso”? You must quiet yourself, and let the constant stream of concerns, fears, thoughts, and wishes not get your attention. Easier said than done, right? It is not really meditataion, however. You are only allowing yourself a moment to prepare for the next phase. This transitional period can be used to reflect on how to use the coming moments most effectively. Have you always made the most of whatever you have spent your time on? Try Mokuso, so you can quiet yourself and focus on how to get the most out of your time. I consider myself lucky, because I live in one of the last worlds where manners are allowed to be taught – the Martial Arts school. Name me another place where manners and courtesy are allowed to be taught. Church? Maybe. But most of the time even in church, you learn WHAT to do, not HOW to do it. In ancient times, samurai were trained killers. It would make sense that when these people came together to train, they would not want to accidently challenge or offend their training partners. Etiquette and manners were (and are) an important part of the training process in the Martial Arts. So, at the Martial Arts school, we always say “hello”, “goodbye”, “please” and “you’re welcome”, we wait for someone to finish before we speak to them, etc. Oh, and “thank you”. We say (and mean) “thank you” a lot. And you know what? Before you know it, it becomes part of your lifestyle. You start to find that the “little pleasantries” in life mean more than you thought they did. You become more pleasant, and everyone around you becomes more pleasant as a result. But here is the kicker; people are so programmed nowadays to expect you to bicker, complain and whine, that they are stunned when you present proper manners. And, the next time they need or want something, who will they choose? The guy who treated them like crap? No, the one who sticks out in their memory as being pleasant/mannered. I attribute my manners to my success in life as much as my college education (one cannot replace the other, however). Its that important. There are some important points to remember, however. 1) You must be sincere. People have an uncanny ability to detect a fraud. 2) Don’t expect an immediate return on your investment (“if I am well-mannered in the interview, they are sure to hire me!”). Over the course of months and years, good manners will get you more in life that poor manners. 3) Dont expect people to understand you when you show exceptional manners; they will look at you like you have a fungus. It will take 2 or 3 times before they “get it”. So would you like to increase the results of whatever you do in life? Great, just keep doing it, and add exceptional manners. It costs very little, but it will get you to stand out in the crowd. And if you don’t know how to have exceptional manners? Come visit us at Aikido of Nebraska, we can help. Aikido of Nebraska was featured in the October Edition of the Star City Sports, a local newspaper/magazine fearturing recreation and sporting activities in the Lincoln area. The article is reprinted in its entirety below. When you’re an emergency-room doctor who wants to open a martial arts school, it’s probably wise to avoid aggressive martial-arts styles that are deemed more likely to send participants to your emergency room. Sensei Todd Roberts now has the best of both worlds. The emergency-medicine specialist enjoys his work as a doctor in the BryanLGH Medical Center Emergency Department. After hours, he now owns and operates Aikido of Nebraska, a new martial arts school at 4209 S. 33rd St., just north of Braeda Fresh Express Café at South 33rd and Pioneers Blvd. “I wanted to learn a form of martial arts since I was a kid,” said Roberts, “but with my line of work, I thought it might be wise to pursue a non-aggressive style,” he mused. Roberts graduated from the University of Nebraska-Lincoln in 1988, from the University of Nebraska Medical Center in 1993, and from his residency at Penn State in 1996. For the past 14 years, he and his wife worked in New Jersey. The Roberts family chose the Garden State to train with instructors, R. Crane and K. Crane at Aikido Agatsu Dojos in Stratford, N.J. A professional opportunity presented itself earlier this year and the Roberts family moved back to Lincoln. In addition to working in the BryanLGH Emergency Department, Roberts has teamed up with LifePointe, 7501 S. 27th St., to teach workshops on self-defense for women. Roberts teaches adult Aikido classes, offering group classes and private lessons from 6:30 to 8:30 p.m. Tuesdays, Wednesdays and Thursdays. Especially popular with women and adults of all ages, Aikido is considered to be a non-aggressive style. The basic principle of Aikido is “do not fight force with force.” It uses very few punches and kicks. Instead, the attacker’s force is redirected into throws, locks and restraining techniques. The techniques of Aikido are such that they can be applied to larger, stronger opponents with great effectiveness. For more information about Lincoln’s newest martial arts school, call (402) 261-6655. I Paid my Money. Where’s my Martial Arts Instruction? We as Americans often get caught up in the “Power of the Consumer”. Americans collectively have tremendous power to shape the economy and the culture by what they buy. Some however, take this one step further. Some insist that you have an obligation to them because they will buy/have bought your product or service. Its the “I bought you, I own you” mentality. Nowhere does this mentality clash more than Martial Arts schools. I have often considered the value of my Aikido training over the years, and the gratitude and obligation that I have to my instructors. In traditional schools such as Aikido of Nebraska and others, the student must understand that what he is paying for has nothing to do with the Martial Arts Instruction. How can that be, you say? Like many things in the Martial Arts, it is steeped in the culture and tradition of the arts themselves. Your Martial Arts Instructor has often sacrificed a great deal in order to provide you with quality Martial Arts Instruction. Your Instructor has trained years to get to the level necessary to teach, has sweated, bled, and suffered through injuries, often taking a toll on his/her family, job, friends, and finances because of his/her training. Have you suffered through injuries, finances, and years of arduous training to teach at your job? Such a personal sacrifice is beyond value; hence the idea that you can’t “buy” instruction, it can only be given to those worthy enough to understand what they are recieving. Now, it is simplistic to think that martial arts schools are “above” the concept of money. It is not wrong even, for a school to make a profit, provided that they are providing a valuable service to the community. Every school has expenses, including the time of the instructor. But remind yourself that what the student is paying for, in terms of dues, has to do with providing an environment suitable to training in the Martial Arts, not the instruction itself. That aspect is beyond price. I am still indebted to my instructors for sacrificing all that they did to give me the instruction I recieved. It is far beyond what I could have paid them. They gave me a piece of themselves. For that I am forever grateful.